Developers completed tens of millions of square feet of new product in just three years, including 25 million in the I-55 Corridor near Joliet alone. 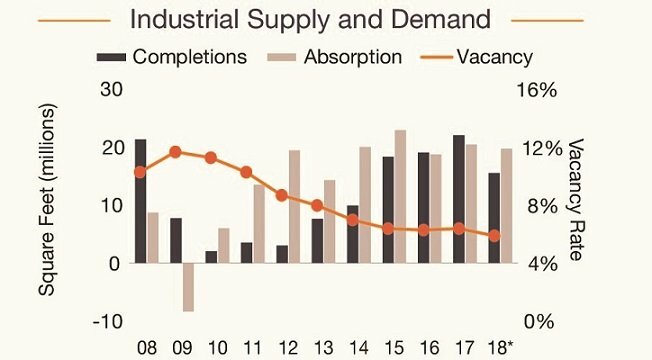 New development will slow down somewhat in 2018, and be outpaced by net absorption. Chart by Marcus & Millichap. CHICAGO—The road to recovery has been a long one for the Chicago region. But the explosion of demand for industrial product in the past few years, mostly to due to the rise of e-commerce, has fully revived the sector. A new forecast by Marcus & Millichap says the vacancy rate will sink to just 5.9% this year, the lowest in a decade. What’s remarkable is that will be after developers completed tens of millions of square feet of new product in just three years, including 25 million in the I-55 Corridor near Joliet alone. But this revival has spread far beyond that traditional distribution hub. 4050 Rock Creek Blvd. 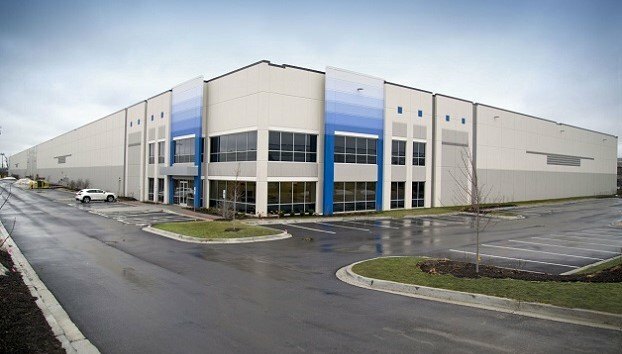 is a 291,728 SF industrial facility in Rock Run Business Park, Joliet, IL, recently built by by IDI. Kenosha County in WI has also come into its own as an important distribution hub, M&M says. It “should also continue to log tight vacancy through the remainder of the year as rents are significantly lower than some other northern sections of the metro.” The 16 speculative projects totaling 4.8 million square feet completed since 2014 are now 73% leased, and developers currently have five speculative construction projects totaling 1.6 million square feet under construction and will soon break ground on an additional two projects totaling 771,095 square feet. New industrial development closely tracks job creation, and the Chicago should be relatively healthy this year. M&M forecasts the region will add 43,000 jobs this year and developers will add another 15.5 million square feet to the industrial inventory. That’s a solid number, although somewhat below the previous three-year average of 19.8 million square feet. Still, the tightening market should keep rental gains strong for the rest of the year, and push the metro’s average asking rent up 5.2% to $5.71 per square foot. Brian J. Rogal is a Chicago-based freelance writer with years of experience as an investigative reporter and editor, most notably at The Chicago Reporter, where he concentrated on housing issues. He also has written extensively on alternative energy and the payments card industry for national trade publications. Listen to our exclusive audio interview about how virtual reality technology is speeding design and development of approximately 220 residences in the year-round, live/work/play community in Greater Green Bay.